What our happy customers have to say. Hi Steve, Thank you. If I’m in need for an ice-cream bike for a future event, you will definitely be first on my list. That is absolutely delicious. Do you make it yourself? Steve and his ice cream bike to our friends. Thank you for contributing to our perfect day. Many thanks for all your hard work on the 19th. It was great to meet you and we will definitely be in touch in the future. Just to say thank you for being part of Jemma and Harry’s special day on Sunday. The sun shone (well, it didn’t rain! ), the couple were radiant and the ice cream was so scrummy! As well as the mother of the bride, I am actually a florist so if you would like to send me your cards I can give them to any brides I speak to. So lovely to meet you and EVERYONE is talking about how wonderful the ice-cream was so THANK YOU from all of us at UK Sport. Thank you again and we are certainly going to keep your details on file for any other events we may have. Thanks for doing our wedding on the 21st July. Thanks for bringing the sunshine with you. Hi Steve, Now that we’re back in the real world, we just wanted to say a massive thank you for being our ice cream man for the big day. We had loads of compliments about you, your bike and your ice cream that we wanted to pass on. You were an absolute pleasure from start to finish, the ice cream was amazingly good and your services are such great value. We thought you might like a photo or two for your website (or just for your own eyes!) that our photographer took. We particularly like the one where even the cows got to enjoy themselves! Thank you so much Steve for all your help and all your great ice cream!! Everyone loved it!!! Please pass on our thanks to your daughter Georgina! Hope to see you again soon, will think of you for any new event. Just wanted to thank you again for the amazing job (and ice cream) you did on Friday, every body commented on what an amazing touch it was and how good it tasted, if there is somewhere on your website I will most certainly leave a testimonial. Hi Steve, Just wanted to take time out to say thankyou so much for the service you gave us at our wedding on 28th june 2014. Everyone has commented on how nice the service was and the ice cream was the best they had ever tasted. Also there wasn’t many who just stopped at one cone but wanted to try different flavours. Emma and I were really pleased, with the time and effort you put in and would certainly recommend you to anyone else wishing to have something a little different at their wedding. Thanks again. 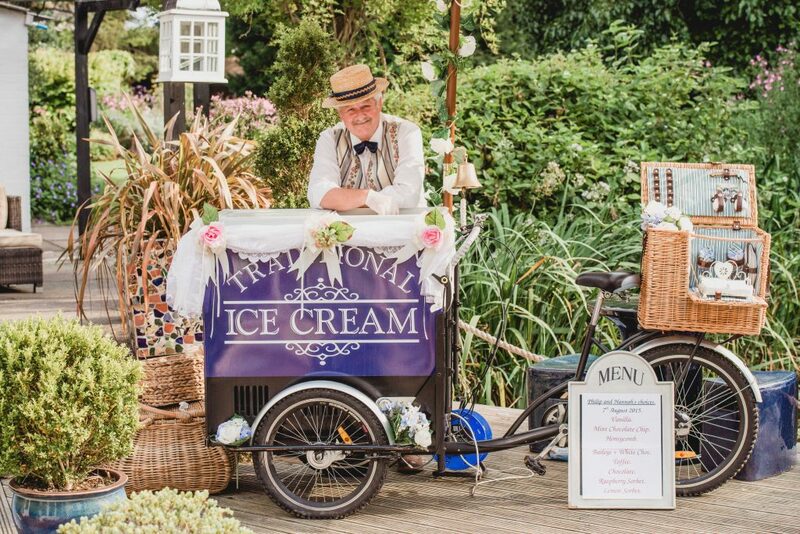 Just to say thank you so much for coming to Joanne & Cezare’s wedding yesterday at Bedford Hall, the bike was a huge hit and the ice cream was sooo good. I just want to say thank you soo much for all your in put in Friday the 25th July. Everyone including the venue commented on how lovely you was. If you ever would like a reference etc let me know.